AMD Media Codec Package or formerly known as ATI Avivo is a complete set of tools that you will need for converting videos and transcoding. It consists of AMD Video Converter and the media codecs for transcoding applications. 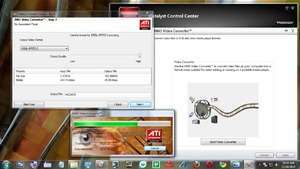 Please note: AMD Video Converter will only work with ATI Radeon HD 2000 and above video cards. For security reasons, you should also check out the AMD Media Codec Package download at LO4D.com which includes virus and malware tests. Additional screenshots of this application download may be available, too.